The Alaska State Senate has passed a bill that would eliminate daylight saving time. Fighting over Alaska’s clocks has been a favorite pastime of legislators for decades. 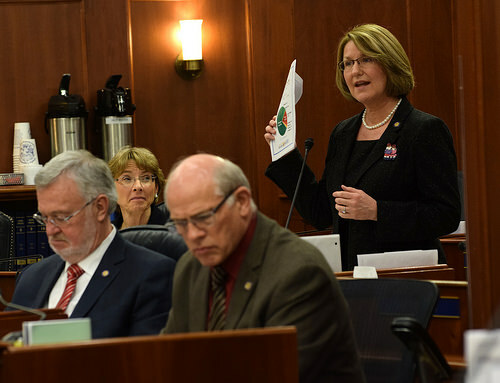 So when Sen. Anna MacKinnon, an Eagle River Republican, presented the bill on the floor, she went through the many, many failed attempts to rid Alaska of daylight saving time. “In the 21st Legislature, then-Rep. Kohring introduced a bill to repeal this. In the 22nd Legislature, Rep. Lancaster introduced a bill to repeal. In the 24th Legislature, Sen. Olson introduced a bill to repeal it,” MacKinnon said, rattling off a list of previous efforts before getting to her own. MacKinnon described her bill as a health and public safety issue, and said it could even help high schoolers bring up their SAT scores. She pointed to studies linking increased heart attack and suicide rates that come with the disorientation of time changes. MacKinnon’s version would eliminate the need to adjust clocks twice a year. In the winter, Alaska would be four hours behind the East Coast, like it is now. But from March to November, Alaskans would be five hours behind, as other states spring forward. Her bill also includes a provision allowing Alaska to petition the United States Department of Transportation for a time zone change. If the federal government approves the request, all or part of Alaska could be moved to Pacific time. That language was added as a concession to Southeast, where area businesses have complained the bill would affect tourism revenue in Southeast by reducing the number of evening daylight hours in the summer. The concession was not enough. Sen. Bert Stedman, a Sitka Republican, called the legislation a “commerce-busting” bill. “This is just another nail, in fact it’s probably a stainless steel wood screw — in our economic coffin,” said Stedman. Under MacKinnon’s legislation, the sun would set at 9 pm in Southeast for the summer solstice, and then daylight would break around 2am. Representatives from the aviation industry have stated their flight numbers would have to be reduced, and the cruise industry has said the change would negatively affect their passengers. On a state level, Alaska would be farther behind the stock market’s opening bell, and NFL games would have earlier kickoff times during the first half of the season. Stedman was unconvinced the potential benefits outweighed the costs. “I might get a heart attack here debating this issue, but not from changing the time zone,” said Stedman. But for the most part, Southeast lawmakers were alone in their opposition. Some senators noted the northern part of the state will always have clock problems, as will the western part. “If you can’t even make up a good answer why we’re doing it, it must be pretty stupid,” said Stoltze on the floor. The bill passed 16 to 4, with Stedman being joined in opposition by Juneau Democrat Dennis Egan, Anchorage Democrat Berta Gardner, and Anchorage Democrat Johnny Ellis. It will now be considered by the House.